Nodame Cantabile was somewhat special, even though the animation was considered retro-like, you could say it was simply beautiful; not because it had an abundance of hilarious Nodame scenes, the music alone was pure awesome. At first, this series didn't seem that 'great' -- you've to really give it a go and ignore the style and other minor aspects. I've passed the halfway mark and I'm enjoying every minute of Nodame's crazy schemes (well, not exactly), and the brutal aftermath where Chiaki ends up beating her senseless -- the one thing I love the most is the music. About the wall; I started yesterday with some motivation from the anime series, and decided to vector the first scene from the closing credits. Of course, that wasn't really enough to suffice, so I went looking and found silhouettes of Chiaki and Nodame, vectored it and place them in the excess area (left of the wall). I'm not sure on what they're called; musical notes or scores? But that doesn't really matter for now -- I vectored those things and placed them around the wall. As you can see, there are four faded lines sprouting from the edge of the rainbow-like piano, which denotes on how sounds can produce the emotions that we experience, whether melancholic or happy. Last but not least, I blended some textures which can be found at Desktopanime. Well, I'm not sure on what to think of this wall; probably doesn't do the series justice, but it was fun I suppose. 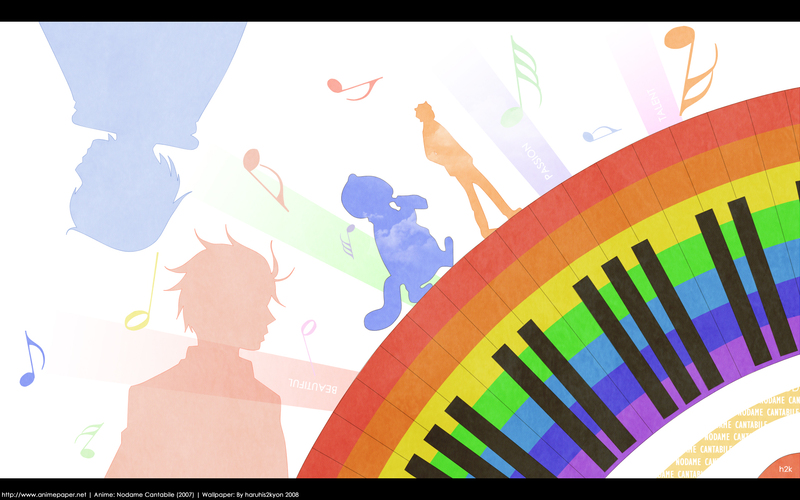 Mukyuuuuu~ wonderfull wallie XDD nodame is a great series! thanks for sharing mate !